Do you sometimes think you know what you're doing, only to discover you kind of don't? Yeah. Me too. For the blog post where I look like I know what I'm doing, click on the image below and hop over to the Oliver + S blog. So, let's start with the inspiration and what I was trying to do. I attend a weekly French class. Well, it used to be a class until we completed the course, now it's more of a discussion group but we have kept our teacher on a retainer so we don't get too distracted. Anyway, one of the other students subscribes to Point de Vue and often passes on the copies. It's like flipping through a moderately high brow weekly magazine. Lots (make that LOTS) on the various royal families of Europe, but also some real articles on French history and culture and of course a regular fashion spread. 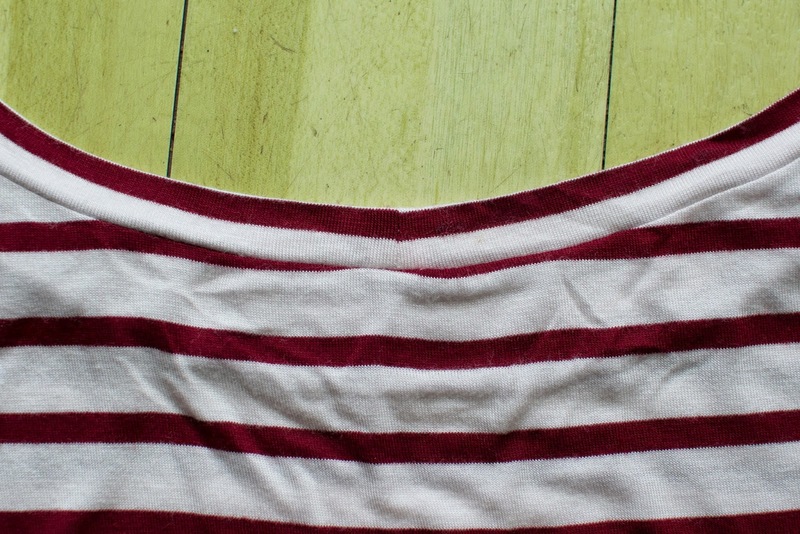 I am hopelessly addicted to stripey tops and I WANTED that one. The photo credited Peter Hahn and I was curious to see what the "prix sur demande" might be, but this particular top was nowhere to be found. No worries (I'm obviously still very much an Aussie!) I can make one. While I was hunting for the fabric I was also thinking about how to make the top. What I needed to start with was a drop shouldered T-shirt. I was about to start changing up the front of the Weekend Getaway dress when the Bento Tee pattern was released. Bingo I thought, that's my solution right there. 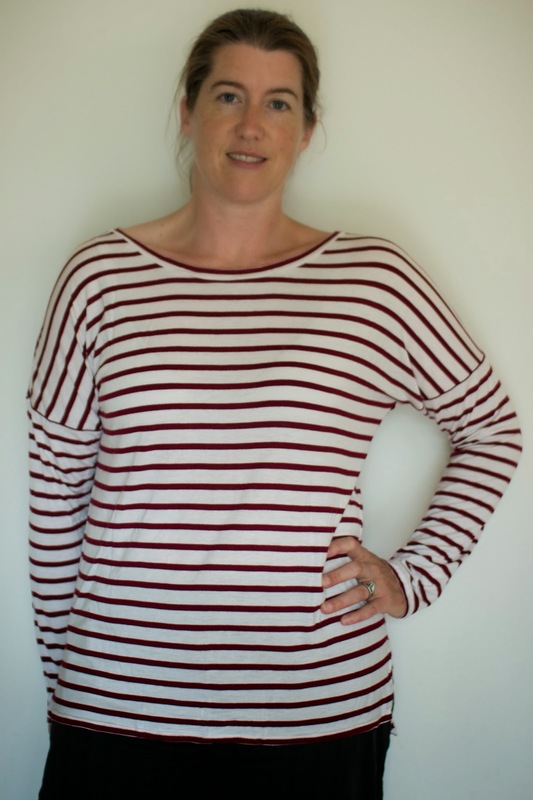 Mindful of my Oliver + S blogging duty, I thought I'd do a nice tutorial on adding a hem facing to a knit top to achieve a neatly curved hemline. That was my plan. I made my short sleeve Bento Tees as practice runs then planned the modifications. I wanted a deeper neckline, a slimmer, longer silhouette and the hi-low hem with the steeply curved side split. Only at the last minute did I realise that the sleeve of the Bento tee has a curve where it joins the body. 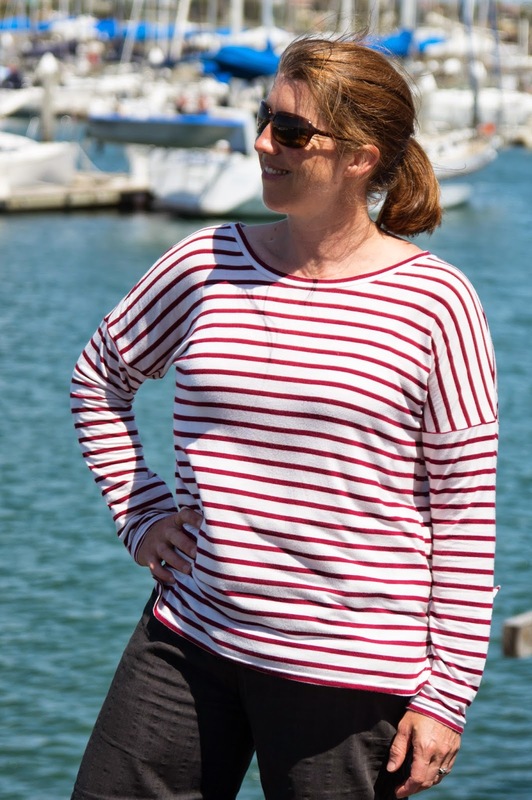 The short sleeve, striped version seen in the pattern advertising works because the cuff turns up and covers the bit where the stripes would look wonky. 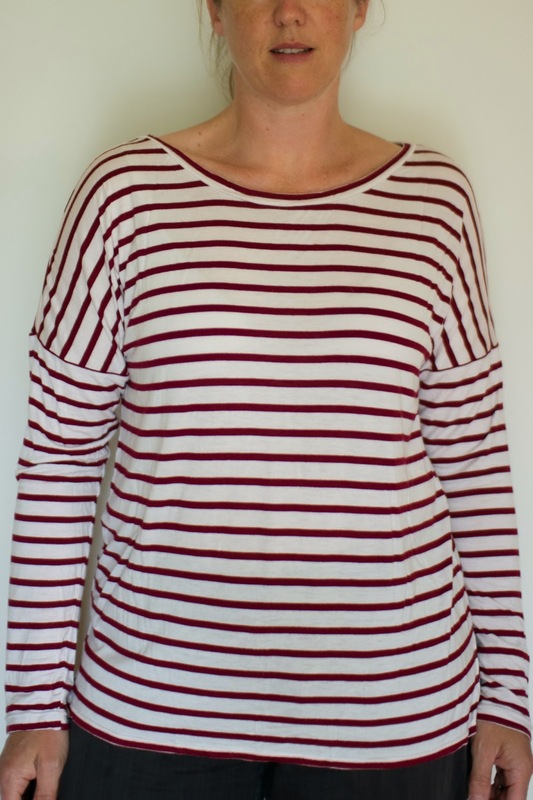 A long sleeved version would need the sleeve squared off in order for the stripes to be parallel to the seam across the arm. And in adjusting the sleeve to get the Stripe Solution I found my blog post after all. Luckily, 'cause I then went on to completely butcher the original hem facing idea. I painstakingly drafted and cut a hem facing which I intended to sew to the hem, flip to the inside then stitch down. Somehow I lost all my stripe-fu by this stage and even though I'd laboured over the cutting, the hem facing was not going to match. Then it became apparent that nothing was going to "flip to the inside" as sharply as I'd imagined. There was much clipping close to seams and still plenty of puckering. Eventually, in a salvage attempt, I cut the facing off. But I was then left with very little fabric with which to hem the shirt. I'm usually quite fussy about my knit hems. I overlock the edge, turn it under and then twin needle stitch such that the bobbin zig-zag is on the overlocked edge and it all looks quite professional. 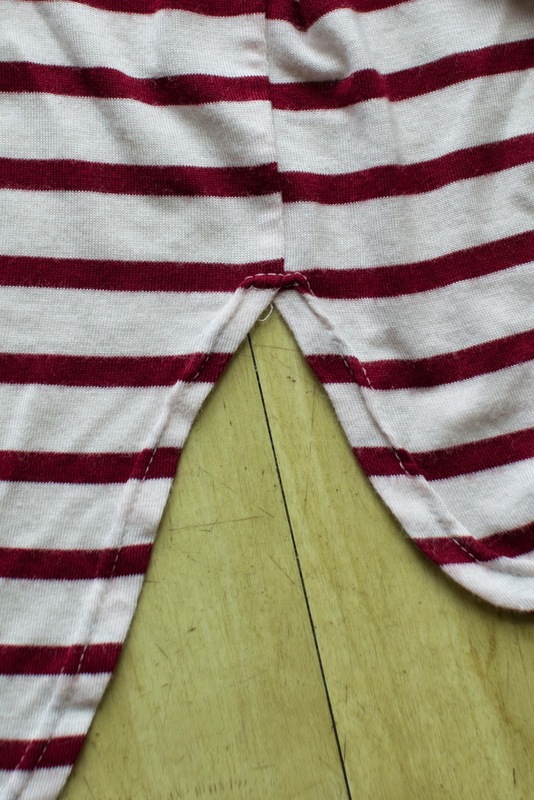 Oh, and one other blindingly obvious thing: you can't sew tight curves or 90 degree angles with a twin needle. There ain't no lift and pivot when you've got two needles in the fabric. Kind of like how trains can't turn corners. Seems very obvious now, but I needed to go there to realise it. This is what happens when you try to sew a tight curve with a twin needle. Ick. If only I had sewn the side seam with the sewing machine and finished the seam allowances separately I could have pressed the seam allowance to each side at the split and my hem might have worked. Perhaps I also wouldn't have mucked up that stripe matching seen above. One part of the original plan which was also quickly modified was the neckline. I'd planned a below the collarbones neckline with a turned under hem and no neckband. But I'd been a bit scissor happy in creating my new neckhole and it would have been enormous! Ok, a neckband was needed. I don't think there can be a formula for how long to cut a neckband when you've modified the neckhole as it depends so much on the fabric. I cut it the width that suited my stripes and a length that was about an inch shorter than the measured circumference of the neckhole. Then I pinned the neckband loop to the shirt and kept shortening it by inch to half inch increments until I felt like the neckband needed a reasonable stretch to fit the T-shirt. Then I got lazy and attached it straight up with the overlocker and fluffed the centre back neckline a bit. C'est la vie, huh. What was successful was my changes to length and width. I lay the Bento Tee pattern piece down, then my pattern tracing interfacing, then the Neptune tee pattern piece on top. I drew a new side seam that was somewhere in between the narrow Neptune and the boxy Bento. I used the Neptune's length with a little more added to the back and free drew my own curved side splits. I wish I'd taken a photo of the unhemmed splits as they looked great. S'funny I can't leave a knit hem unfinished. Even my somewhat mangled hems on this top seem more complete than if I'd done nothing. I've rather enjoyed writing this one up, warts and all. I know I'm fussy and I'm not fishing for compliments by pointing out my mistakes. Just noticing what I botched and making a mental note to do better next time. I love this top and I can see myself wearing it 'til it falls apart, which may not be all that long! I'm still perplexed about how badly my imagined hem facing married with reality. That's a problem that remains in need of a solution. If I ever find the perfect asymmentrical white on red stripe, I'll come back for another attempt! It is good to get it wrong sometimes isn't it! these sleeves are very much in vogue. 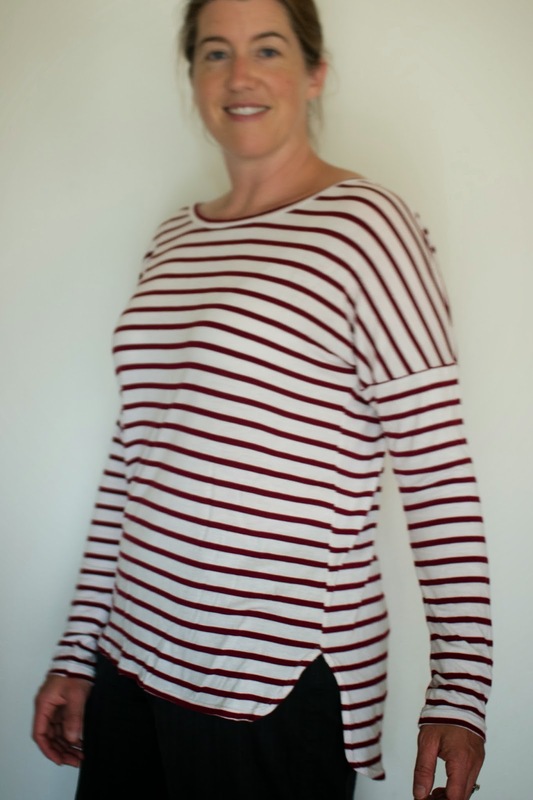 I have made two tops using a Style Arc pattern that has sleeves made pretty much as you describe. I'm also going to copy a lovely wool hooded top that I wore most of last year which has a similar construction. Should be fun. Even with your challenges, you have made a very smart top which looks fantastic. Have you got a coverstitch machine? The needle position on the coverstitch let you pivot at those tricky corners very well as well as giving you a great hem. Thanks Sharon. The sleeve adaptation is a pretty easy modification and the hem shouldn't be half as hard as I made it look! You are so clever for working all this out. Facings and twin needle nightmares aside, this is a seriously wearable top. Thanks Katy, apart from the clever bit that's exactly how I feel about this top too! Well it looks really good, despite all the little issues. I've encountered that twin needle dilemma before - but I think mine was a less sharp angle and I managed to sew up to the side seam, then reposition the needles to sew back down the other way. If you hemmed before you sewed the side-seams it would perhaps have been easier...? Yep, that would have been easier, as it would if I'd left the side seam allowances separate. Live and learn, hey. I did lift the needles and reposition the free fabric to get the direction changes but that's a bit sloppy. Thanks for the compliment, I've been wearing it almost non stop. It feels awesome. That would have worked, thanks. Meanwhile I've been searching for the perfect very wide green and white stripe for a dress for A, and of course I should Spoonflower (as a verb) it. So who exactly is the neabler? Oh, and I second the suggestion about a coverstitch machine! I love mine and it was pretty cheap. The finish is so professional and there is a choice between chain stitching or double and triple stitching depending on the look you're going for. And it's really easy to thread. C'est une très jolie chemise! (and I've exhausted my high school french) The 'warts and all' aren't noticeable and you've certainly gained some knowledge on what will work next time you make a similar style top. It looks really great from here, especially how you matched those shoulder stripes! 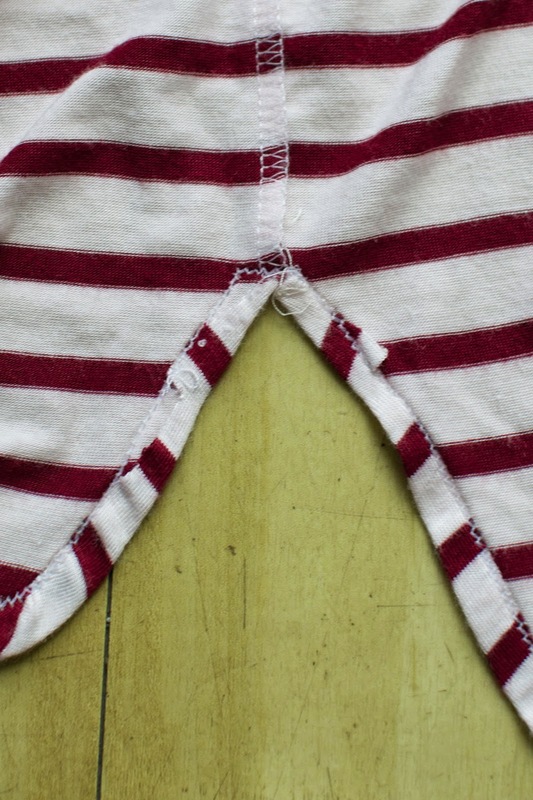 You'd think every stripe known to man would be available, but no. And I agree that hemming before attaching side seams may have been your best bet here for such a sharp angle. I just got a coverstitch machine for Christmas but haven't quite figured it out yet aside from a couple test runs...nice to know you can pivot! Haha. This is my third attempt at a comment - I don't know if the previous two disappeared or are waiting to be approved... but thought I would try again, because I know you've mentioned trouble with comments in the past. If the others are waiting for approval then just delete this one! Anyway, all I wanted to say was that the finished product looks great, and I really enjoyed reading about your process.